Tuesday afternoon after having landed in Rome’s Ciampino Airport on Feb. 5, 2019, Pope Francis traveled to the Basilica of Santa Maria Maggiore to offer thanks for the success of his two-day Apostolic Visit to the United Arab Emirates, marking the first time a Pope has stepped foot in the Arabian Peninsula, Feb. 3-5, 2019, for the occasion of the International Interfaith Meeting on Human Fraternity. ZENIT’s Senior Vatican correspondent, Deborah Lubov, was on the papal flight, covering the trip. 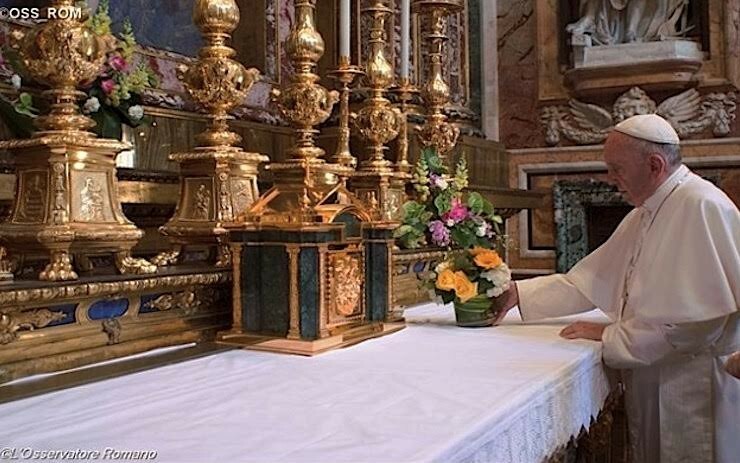 It is already a usual detour for the Holy Father to go to the Marian Basilica; he always venerates the icon before and after his international apostolic trips. During his time inside, Francis prayed before the ancient image of Mary, Salus Populi Romani, in silence for several minutes.